Great beach-themed condo rentals in Sanibel Harbour, FL at Resort Harbour. Light and bright all day. Sofa sleeper in the living room with a matching loveseat and chair. New Sony Flat 40' flat screen Television. King bed in the master bedroom and two twins in guest bedroom. Separate tub and shower and walk-in closet in master bath. 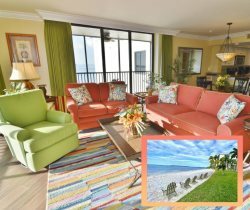 This Sanibel Harbour rental on the beach features beautiful views of the Gulf from the screened-in balcony and master bedrooms. We would love to come visit again, and stay in 411. It was a very relaxing time for our family of 3. There were great views. The condo had almost everything we needed. This is an excellent location with beautiful views. Its very quiet and private. You have your own little beach and a nice pool. The units are spacious and well equipped. The only thin I thought of was could they provide a few more kitchen garbage bags. I appreciated that there were lots of towels. Our coffee pot had a hairline crack in it and your team member,immediately responded with a brand new machine at our door within 5 minutes! Sanibel Harbour Resort unit 411 was our first VRBO stay. It was the best experience ever. The process to reserve was easy, the team responded immediately and they were professional, friendly and efficient. We received the check in information as promised and arrived at our property and entered into what we saw online and better, which was definitely not a let down. Everything was clean, bright, airy and pleasant with a great view. We had a side unit that overlooked the private pool and also had a view of the harbor. It was the best of both worlds. There were a few minor things that we noticed, like the password being incorrect for the internet. However, we informed the property team and they were very receptive and appreciative and am sure this is already corrected. All I can say was, what a great vacation. We went on the Princess sunset dinner cruise and got a taste of the neighboring major hotel and resort, then realized how lucky we were to be at this lovely condo. The place next door was sooo crowded and the pool was packed. We had our own quiet pool and beach and it felt like our own elevator at all times. We will definitely be back and recommend this property to anyone. Thanks so much. What team? There really wasn't anybody around 90% of the time. WE REALLY enjoyed our pool - Very rarely does one see a pool maintained so beautifully, VERY clean water and clean pool area. Just wonderful. Our stay was wonderful, the amenities I this property were great, restaurants within walking distance, the view could not have been better, Very peaceful. Wish I could of stayed at least 2 weeks. We didn't actually meet any members of the team. It was a very enjoyable stay and we were very happy with the rental.